2018 is already turning out to be an exciting year for books. I say this because all the books I’ve read so far, the ones published this year, have been superb reads. And “Self-Portrait with Boy” is the latest addition to that list. Lu Rile is a young photographer struggling to make ends meet. She has an aging father. She has no permanent house. And then one fine day, in the background of a self-portrait, Lu accidentally captures on film a boy (Max) falling past her window to his death. This picture turns out to be perfect – the best that she has done. This picture could change her life for the better. At the same time, the boy was her neighbor’s son and soon enough Lu forms a bond with Kate like no other. The question then is: Will Lu use the picture to advance her career or not? For that, you would just have to read the book. I loved the premise of “Self-Portrait with Boy”. It is intense, profound and heartbreaking. While it is one of those conundrum plots, it is also about empathy, loneliness in the city and the relationship we share with death and redemption. You know at one point, the plot may also not seem original to most, but what does stand out for sure is Lyon’s writing. Lyon is no-holds-barred with this novel. She is all guns blazing. I love the setting of the book – the ​early 90s in Brooklyn. The world is on the ​ significant brink of change and amidst all of that, anything can happen and it does. Lu and Kate aren’t easy characters to deal with. The other residents of the building are beautifully etched. There are so many questions that need to be answered while reading the book and there comes a point when you are strangely okay as a reader at those not being answered. It has a lot to do with Lyon not finding the need to those being addressed and making you comfortable as a reader, while turning the pages. Part-mystery, most parts literary, “Self-Portrait with Boy” is a book with so much empathy and loneliness of the human heart, that you will find yourself weeping and stunned by the prose. This entry was posted in 100 Must-Read Debuts, 2018 Literary Reads Project, 2018 Women Writers Reading Project, Books, Literary Fiction, Literary Reads 2018, Scribner, Simon and Schuster, women, women writers, Women Writers Reading Project and tagged 100 Must-Read Debut Novels, 2018 Reads, Debut Novels, February 2018 Reads, Fiction, literary fiction, Literary Fiction Reading Project, Rachel Lyon, Scribner, Self-Portrait with Boy, Simon and Schuster, women writers, Women Writers Reading Project on March 3, 2018 by thehungryreader. I have not read much by Graham Swift. I have always found his books to be slow and kinda dragging, however this time round when I did read his latest, “Mothering Sunday” – I was left with a tingling feeling of melancholy, happiness and some bittersweet feeling that I couldn’t place my finger on. In short, I loved what I read. The book is different. It is short – almost a novella and it takes you on a rollercoaster of emotions like no other book I’ve read in recent past. “Mothering Sunday” is about a day that changes everything – 30th March 1924. The day is Mothering Sunday. The question is how Jane Fairchild, an orphan, spends her time when she clearly has no mother to visit? Jane Fairchild is only twenty-two, working at a house as a maid since she was sixteen. She is in love with Paul Sheringham, young heir of a neighbouring house. The two you guessed right, meet again on that Mothering Sunday and life isn’t the same ever again. The book is about her life, the love that she stumbles on and what happens thereof. I wish I could say more but I just cannot. You would have to read the book to figure that one out. The writing is superlative. People say that “Waterland” or “Last Orders” is his best work. I think hands down this one is. The writing is precise and yet says so much given the scope of the book. The story is of Jane’s understanding of the world and how she comes to the conclusion and learns to make peace with her situation. All I can say is that the book has these fantastic metaphors and one-liners that will stay with you long after you have finished the book. This entry was posted in 2016, April 2016 Reads, Graham Swift, Literary Fiction, Scribner, Simon and Schuster and tagged Graham Swift, literary fiction, love story, Mothering Sunday, relationships, Scribner, Simon and Schuster on April 12, 2016 by thehungryreader. We think we see all the time. We think we observe. We also think we possibly know the world around us the way we are meant to. We see what we expect to most of the time. Maybe our mind conditions itself to show us only those things which we want to and the ones that we do not want to, well, they just get hidden. It could happen anywhere. In a familiar neighbourhood or maybe in a place you have never been to before. Maybe it is all about perspective or maybe about security, however it exists in all of us. The way we see and perceive of our surroundings or rather what we do not see. 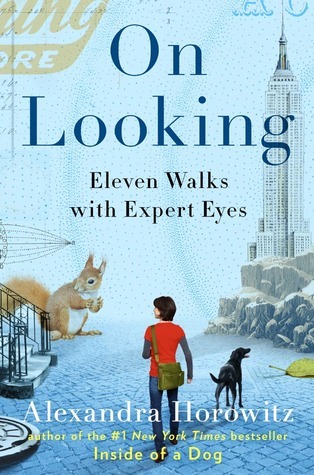 “On Looking: Eleven Walks with Expert Eyes” by Alexandra Horowitz is a book that maybe does not teach you how to look, but definitely provides some refreshing perspectives on the subject. The premise of the book is simple: Walking around the same path in a city with different people, almost eleven people or as she says twelve, and getting their point of view. The people ranged from her son to well-known illustrator Maira Kalman to a sound designer, bringing not only different perspectives but also making her and the readers think about our own perceptions. I have loved almost everything about the book. From the way it is written to its premise. Sometimes it did become a little stretch; however I ignored it very easily with the turn of the page. “On Looking” brings together several elements at one time – it speaks of a simple everyday act, of different people performing it, through the same track and yet provides so much in the form of perceptions and how different people discover different things. The book is definitely interesting and well written. Very rarely do I come across something in the non-fiction genre that catches my attention, but when it does, I savour it and mostly end up enjoying it as well. We hardly pay any attention to our senses and this book is a reminder of that fact. What it also does with its simplistic writing and views, is makes you want to see things differently. To me that is the highlight of this wondrous book that ultimately speaks of seeing things closer to you than to go in search of them far and beyond. A great read for sure. This entry was posted in Books, Non Fiction, Review, Scribner and tagged Alexandra Horowitz, Non-fiction, On Looking, Scribner, travel on May 1, 2013 by thehungryreader.